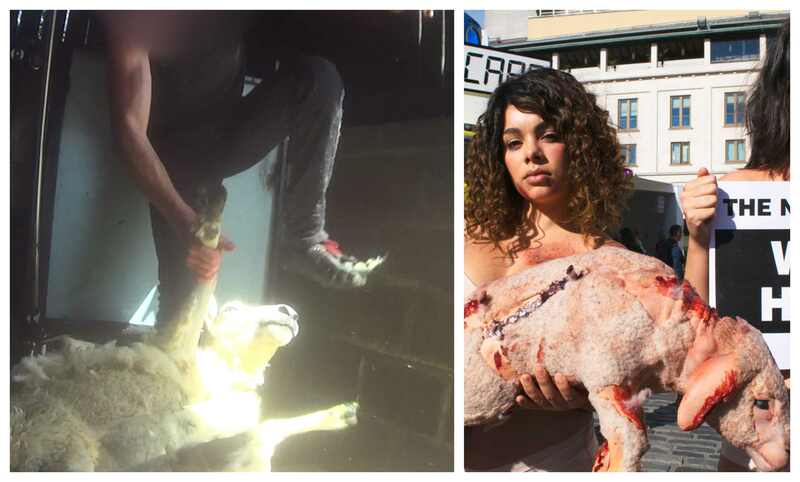 Vegan activists protested next to the Wool Care installation in central London today in a bid to bring attention to animal abuse in the British wool industry. Activists representing vegan charity PETA held signs saying: "British Wool: Sheep Kicked and Beaten" and "The Naked Truth: Wool Hurts." The protest follows the organization's video exposé of the British wool industry, which revealed sheep being punched, kicked, and jabbed in the face in multiple UK shearing sheds. "Sheep are gentle prey animals who are petrified of even being held down, yet they endure vicious beatings, bloody wounds, and broken limbs in the hideously cruel British wool industry," said PETA Director Elisa Allen. "We want to encourage passers-by to ditch wool this winter in favor of soft and cozy cruelty-free materials for which no animal had to suffer." British Wool issued a statement in response to the footage saying: "We are shocked and saddened by the behaviour of the (two) contractors filmed secretly. "As a farmer-owned organisation, British Wool collects and sells the wool on behalf of British farmers. We are passionate and committed to continuously seeking to improve shearing skills and good practice in the UK.